In balmy Bermuda, it is hard to imagine anything other than fresh air and sea breezes entering people’s lungs. But over the last two decades, scientists working with the Department of Environmental Protection have discovered there are some places in Bermuda where the air people breathe is similar to the polluted air of a big city. “Our monitoring stations at Fort Prospect and BIOS generally have good air quality, and are indicative of air quality for the majority of the island,” said Dr. Andrew Peters, an environmental chemist at the Bermuda Institute of Ocean Sciences (BIOS) who runs the governmental Air Quality Program. It is also true that sea breezes tend to dissipate potentially harmful emissions, including those from Bermuda’s closely monitored municipal solid waste incinerator and power plant. But there are some locations where air quality isn’t as good, and the major culprit across the island is road traffic. A monitoring site at East Broadway has shown that traffic emissions can produce unhealthy levels of particulates, Peters said. On average, the particulates measured there surpass measurements at other sites monitored in Bermuda and sometimes exceed the annual limits set forth in the Clean Air Act. Particulates less than 1/10 the diameter of a human hair include naturally occurring dust and mold, as well as the products of fuel combustion. These tiny particles can lodge in noses, throats, and the air passages of the lungs; consequences can range from wheezing or coughing, to life threatening conditions like asthma and the exacerbation of respiratory and cardiac conditions. “If I mention East Broadway, everyone has seen the silver boxes, the container with equipment on the roof,” said Peters. Although many people pass the equipment on a daily basis, few know its purpose. The boxes contain high-volume motors pulling a large quantity of air across a filter paper. By measuring the weight of the filter before and after twenty-four hours of sampling, they can calculate the amount of particulates in the air that day. In the last year Peters also added instruments that automatically measure and record concentrations of harmful gases. These include sulfur dioxide and nitrogen dioxide, which are released to the air when fuel is burned and are known to negatively impact lung function. 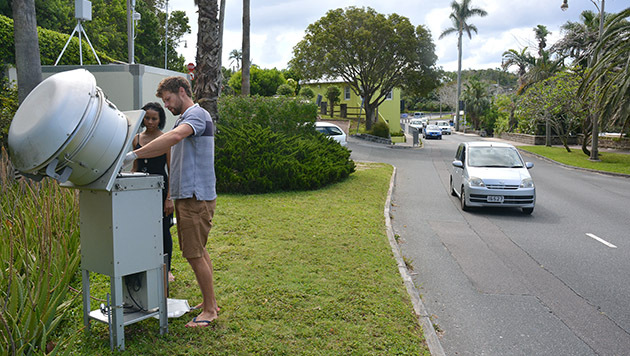 Each day, BIOS technician Matthew Hayden visits the monitoring sites to service the sensitive instruments, since rainfall, salty air and high humidity create a corrosive environment. Hayden also collects the filters to analyze back in the lab. 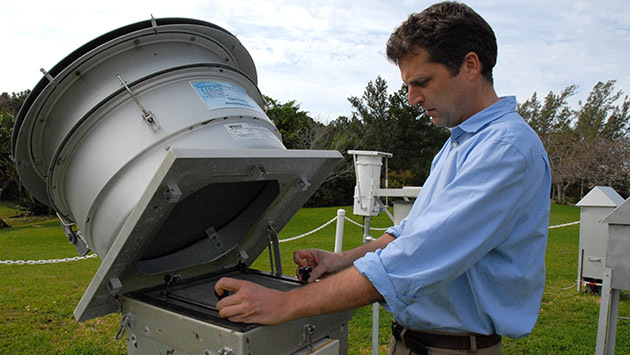 “One passerby was adamant that there isn’t any air pollution in Bermuda whatsoever, so I showed him the filter from the Total Suspended Particle sampler,” said Hayden, who went on to explain that the black, soot-like residue on the filter was largely due to the heavy traffic flow during morning and evening commutes. At the East Broadway site, hourly measurements of the finest particles show a distinct peak in particulates at 8am, during the morning rush hour, and a smaller peak again in the evening between 5pm and 8pm.